Fun with photos, and SCANDAL! Working on a box of photographs recently, I pulled this out of an acid-free envelope. Sometimes a photograph just catches your eye, and the sharp detail and rough textures of this doorway got mine, but the description “Unidentified man in doorway” left the subject of this portrait an orphan of history. Some dozens of photographs later in the same box, I found this one. It’s the same doorway, with the same tool leaning in the same spot against the same shingles. But is it the same unidentified man? No, this man is known, well-known in fact. And the very next photo in the box shows that they are in fact two different people. According to his obituary in the Boston Daily Globe (4/13/1915), the “famous actor” — one of the first to move from success on the legitimate stage to vaudeville — was originally Eben Bradlee, “born in the first house west of the State House on Beacon St., Boston, Feb. 7, 1853.” Plympton (sometimes Plimpton) began acting as an amateur while working as a bookkeeper, a career that “overtaxed his strength” leading him to recuperate in California. There he took his first professional acting job in Sacramento, followed by successes in San Francisco, then back east in New York and Boston, and on to England and to Europe. After leading and supporting roles alongside “most of the distinguished stars since 1880,” Plympton died in a New York hotel of pneumonia, after nine days of illness and a longer period of poor health. 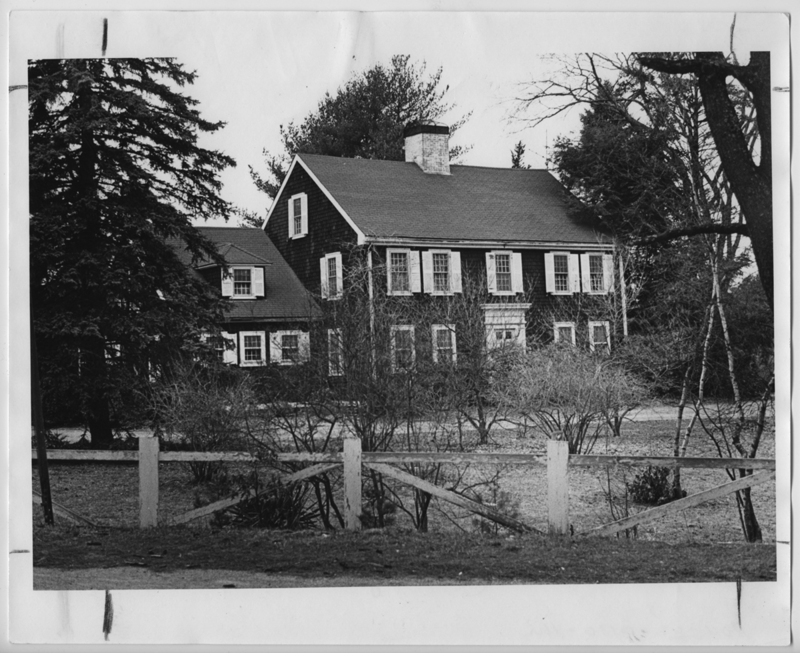 The obituary further explains why the Local History Room has these photos of Plympton: “About 1880, he established a farm home on Silver Lake…which he called ‘The Grange’.” The estate had a private gunning stand, an orchard and extensive gardens. 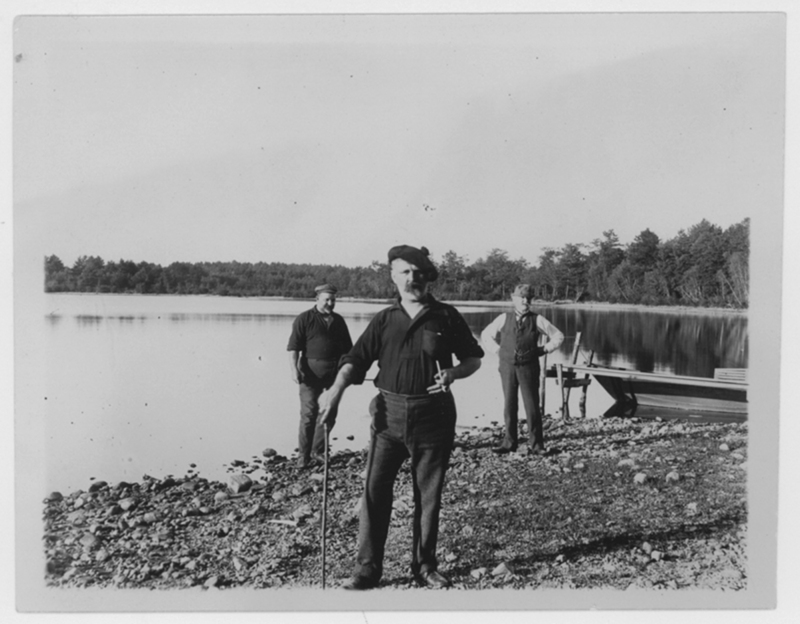 In subsequent summers, he played farmer on his 40 acres and hosted friends from far and wide. In 1905, however, one of these friends — quite possibly the unidentified man in the doorway — had a less than pleasant stay. 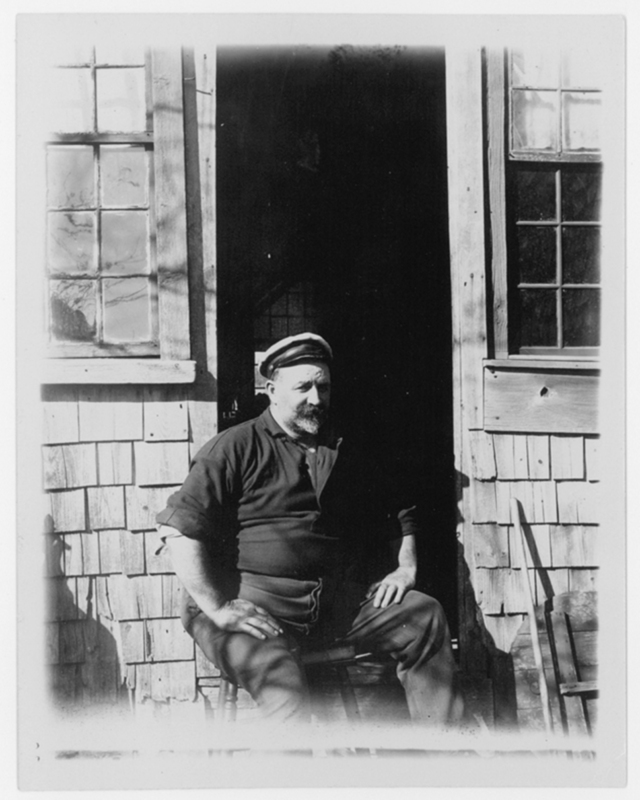 Martin twenty years ago was known to every seafaring man entering New York and other ports. He was always in charge of the biggest freight vessels. While ashore he met Plympton, then an actor of prominence. The sailor had accumulated a little fortune. They lived together and cooked for each other…Martin followed [Plympton] wherever he traveled, helping him in his make-up and stage dressing. For six years, Plympton has only worked six weeks of the year, spending the rest of the time usually in camping with his friend. Why all the press for a less-than-well-known sailor? While the news stories vary in detail, the gist is that “the warmest and most intimate of friends” (Globe obituary) fell out on the night of September 13, 1905. After a day of heavy drinking, Martin purposefully left Plympton at the train station some miles from the Grange. Plympton walked home and confronted Martin. A fist fight followed, with Plympton on the losing end, “left prone on the battlefield in front of the barn” (Old Colony Memorial). Witnesses reported hearing a hysterical Plympton threaten retaliation and the sound of heavy blows. Two days later Martin lay in Mass. General Hospital unconscious from a fractured skull. A week after that, Plympton was arrested for assault with intent to kill and locked up in the Plymouth County Jail. 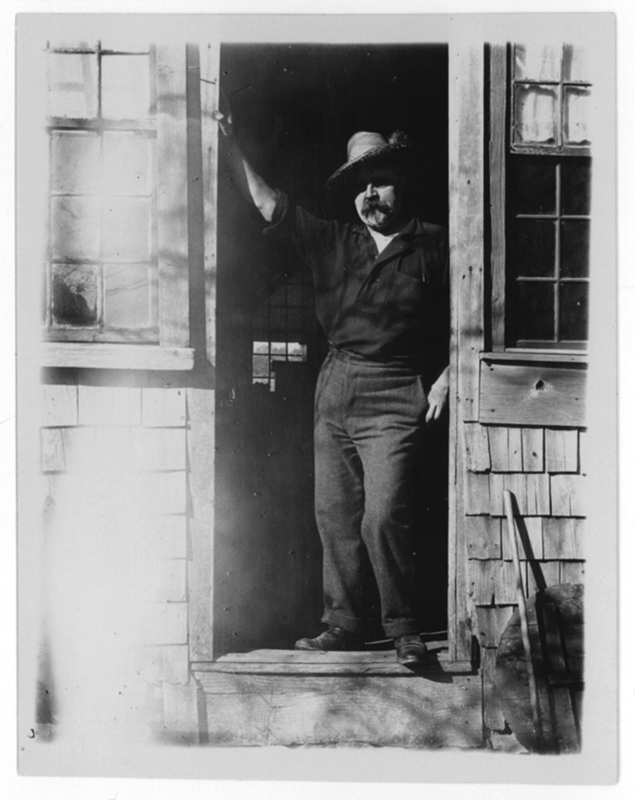 manifested a strong desire to leave the hospital and go home with Mr. Plimpton as his friend…[he] disavowed any claim on his part that Eben Plimpton was capable of any attempt to kill him. Martin was released from the hospital, and by invitation accompanied his “best friend in the world back to “The Grange” and the incident was closed. 93 Lake Street, 1975. Photograph by Ted Avery. Also known as the Jonathan Holmes House and located 93 Lake Street, the Grange was razed in 2011. 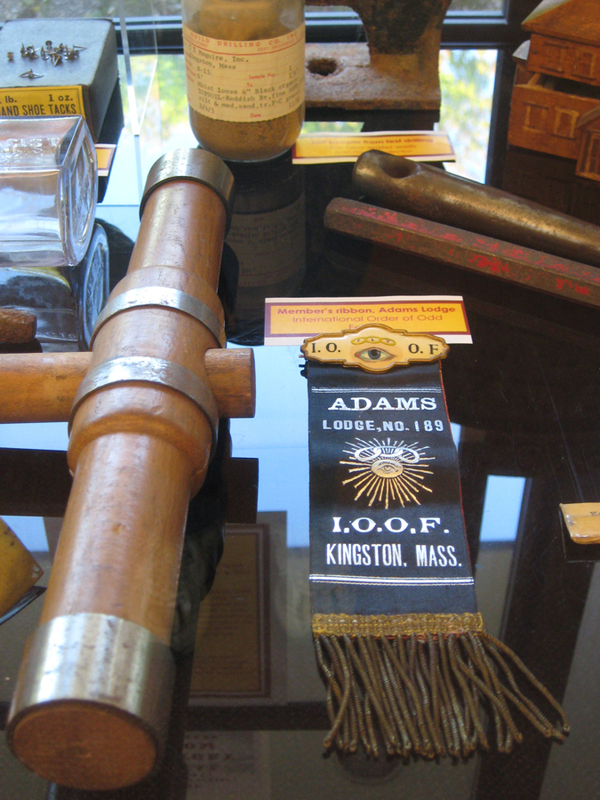 Instead of the photographs and documents usually on display in the Local History exhibit case, this month we’ve got a bunch of things, or more formally, artifacts, relics, realia. In early days, all public meetings both religion and secular were held in the old meeting house and all notices of meetings were posted on the front of the meeting house for parish and town were one. 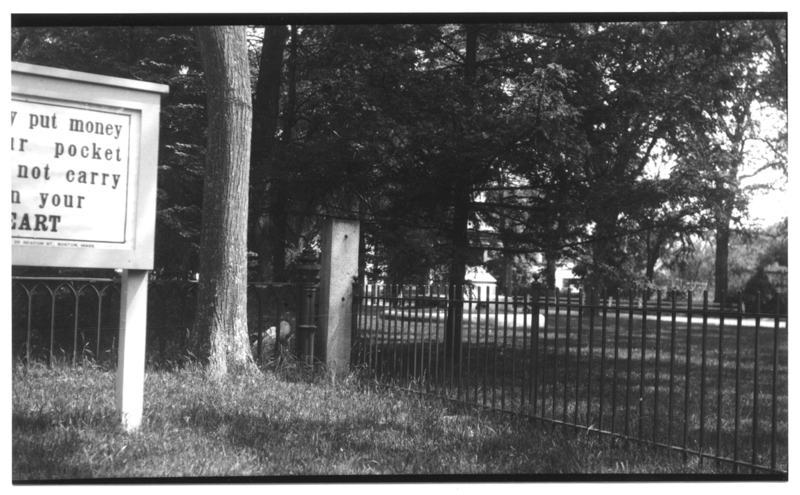 After the formation of separate religious bodies and the building of the Town House, certain notices continued to be posted nearby the meeting house, and for this purpose, a small bulletin board was set up on the post where the wall of the burying ground and the fence around the Green met. This was the Town Post, the post and bulletin board where town notices were posted. Notices were certainly posted there until 1911 and I am told there were notices posted there later but not regularly. The Town Post still stands just between the Training Green and the First Parish Church.